Welcome to the page of AUSC International Executive Committee 2019-2022 Members. During the 2nd All Afrikana First Youth Congress(2ndAAFYC2018) in its 2nd International General Assembly of African Union Students' Council (AUSC), it was approved that the former AUSC International Transitional Committee 2016-2019 ,will lead the AUSC International Executive Committee 2019-2022 with aim to keep important updates to the current leadership of African Union Students' Council (AUSC)"For The Better Africa We Deserve". Small modifications that will be made will focus on completion of still pending important projects that were designed to complete the AUSC International Action Plan 2016-2019. The current AUSC International Action Plan 2019-2022 will be published online on 1st July 2019, and this will be officially endorsed during the 3rd AUSC International General Assembly 2019 on the 2nd day of the 3rd All Afrikana First Youth Congress (3rd AAFYC 2019) from 27th to 30th October , 2019. 1. Mr Iraguha Bandora Yves (Rwanda), Title: AUSC President and Founder, Staying in Kigali-Rwanda. 2. Mr Jomo Eric (Kenya), Title: AUSC Vice President for Democracy and Participation, Staying in Nairobi-Kenya. 3. Mr SAA Bobo LENO (Guinea), Title: AUSC Vice President for Advocacy and Partnership, Staying in Conakry-Guinea. 4. Mr Eliezel Habineza (Rwanda), Title: AUSC Vice President For AUSC President's Office Internal Affairs, Staying in Kigali-Rwanda. 5. Mr Rutayisire Francois Xavier (Rwanda), Title: AUSC International Communication Officer, Staying in Kigali-Rwanda. 7. Proffesor Mammo Muchie (Re-appointment May 20th, 2018), Title: AUSC Presidency's Special Adviser For African Union Focal Point. 8. Mr Niyonsenga Norbert (Rwanda), Title: AUSC Executive Secretary For The AUSC President's Office. 9. Miss Nyiribambe Odile Bandora (Rwanda), Title: AUSC President For Conflict Resolution Committee, AUSC President's Offic, Staying in Kigali-Rwanda. 10. Mrs Bateta Henriette (Rwanda),Vice president to the AUSC President For Conflict Resolution Committee, AUSC President's Office, Staying in Kigali-Rwanda. 11. Mr Hategekimana Emmanuel (Rwanda), Title:Treasurer, AUSC President's Office, Staying in Kigali-Rwanda. 12. Mr Munezero Jean de Dieu (Rwanda), Title:ASIDB Advisor, AUSC President's Office, Staying in Kigali-Rwanda. 13. Miss Uwambayinema Grace (Rwanda), Title: ASICTB Advisor, AUSC President's Office, Staying in Kigali-Rwanda. 14. Miss Twizere Aimee Pascaline (Rwanda), Title: IASELB Advisor, AUSC President's Office, Staying in Kigali-Rwanda. 15. Mr Maniriho Sylvere (Rwanda), Title: ASINMB Advisor, AUSC President's Office, Staying in Kigali-Rwanda. 16. Miss Uwineza Josiane (Rwanda), AUSC International Coordinator For 2nd All Afrikana First Youth Congress(2nd AAFYC 2018). 17. Miss Uwineza Odile , AUSC International Vice Coordinator For 2nd All Afrikana First Youth Congress(2nd AAFYC 2018). 18. Miss Uwantege Leontine , AUSC International Secretary For 2nd All Afrikana First Youth Congress(2nd AAFYC 2018). 19. Mr Nteziyaremye Balinda Vicky Oni (Rwanda), AUSC International Treasurer For 2nd All Afrikana First Youth Congress(2nd AAFYC 2018). 20. Miss Alimatu Jalloh (Conakry Guinea), AUSC Presidency's Special Advisor For AUSC New International Leaders Recruitment Focal Point. 21. Miss Uwase Marie Ange (Rwanda), Title: ASIDF Advisor, AUSC President's Office, Staying in Kigali-Rwanda. 22. Miss Hashimwimana Marcella Delice (Rwanda), AUSC President's Assistant to The AUSC International Coordinator For The 2ndAAFYC 2018, and Appointed AUSC Rwanda High School Clubs Coordinator, and AUSC-Rwanda Commonwealth Students' Association(CSA) Coordinator. 23. Mr Jimmy Omal (Uganda), AUSC international Action Plan Innovative and Creative Manager. 1. Mr Andrew Tangan (Cameroon), United Nations, European Union, Fracophonie and other Non -Students’ organizations, Title: AUSC (UN) Affairs Representative. 2. Mr Oboth Julius (Uganda), International Development Students’ Society Title: AUSC (IDSS) Affairs Representative. 3. Mr RUHUZA Hubert (Tanzania), Commonwealth Students‘ Associations Title: AUSC (CSA) Affairs Representative. 4. Mr Nyikirize Pius, ( Uganda), African Universities Guild Councils Title: AUSC (AUGC) Affairs Representative. 5. Mr Macdonald Sayed (Botswana), African National Students’ Associations Title: AUSC (ANSA) Affairs Representative. African Union Students' Council (AUSC)"For The Better Africa We Deserve"
Subject: Announcement for Awareness raising for the AUSC Divisions . The Office of the President of the African Union Students' Council (AUSC)"For The Better Africa We Deserve " has been working for reaching all the corners of the Globe to reach the African Academicians and professional energetic and dynamic youth in Africa and African Diaspora . This means that our AUSC Family here is a property of all willing African and African rooted people young and old generations to be included inside the AUSC specified Divisions according to own wills . 1)AUSC-Economic Sciences Division ,which has emerged The African Students' International Development Fund(ASIDF),soon to raise the African Students' International Development Bank( ASIDB ). 3)AUSC-Social Sciences Division, which has developed the African Students' International Newsletters Board(ASINB) with a special initial Newsletter Named "THE AUSC ALIVE" the Newsletter which is soon going to be available online with its appropriate website for daily producing voices of African Students and professional Youth from Africa and Diaspora ,also including the AUSC Groups members opinions and Constructive chats and more current African and global news for effective media in this Division . 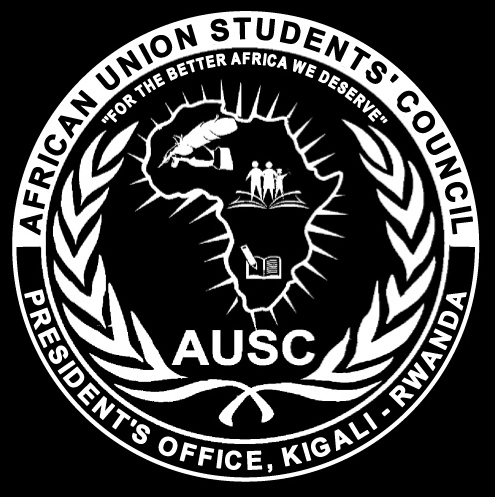 4)AUSC-Education Division ,which has emerged the International African Students' Education Loan Board(IASELB). And more Etc.... In ways coming. Congratulations to each and every one who is contributing in this move in this continent of Africa trying to translate Digital thoughts into physical items and congratulations to the whole family of the African Union Students' Council (AUSC)"For The Better Africa We Deserve ".